After battling a knee injury for much of the season, "Glee" star Amber Riley won the mirror ball trophy tonight over fellow finalists Corbin Bleu and Jack Osbourne at the conclusion of the two-night finale of "Dancing With the Stars." Riley, 27, screamed with joy and hurled herself onto her pro partner, former "Dancing" pro champion Derek Hough, when co-host Tom Bergeron announced that she was the winner. "I didn't know if I could do it, and anything that scares me I want to do, so I want to let women of all sizes out there know you can do whatever you set your mind to. It doesn't matter what size you are, what color you are, you can do whatever, whatever, whatever you put your mind to," an elated Riley said. Bleu accepted second place with smile and a hug for his pro partner, Karina Smirnoff. Smirnoff is a former "Dancing" pro champion. "I thank God for this experience. I thank my family, I thank my best partner in the world," Bleu said, kissing Smirnoff on the cheek. Before the winner was announced, Osbourne was told that he was in third place and wouldn't have a chance at the championship. He, too, took it with good grace. "I've learned that that if you just dive in and if you have a great teacher, it is possible to become a ballroom dancer," he said, referring to his pro partner, former pro mirror ball winner Cheryl Burke. Rileyand Bleu were early standouts of the season and, with a few exceptions, continued to dominate the leaderboard throughout the competition. Osbourne started out with lower scores, but he has shown dramatic improvement. He has multiple sclerosis, and fans have cheered his continued dance improvement despite his health troubles. This was the second night of a two-night finale that started Monday. Comedian Bill Engvall, who made it to the first night of the finale despite his obvious technical struggles and with the help of a supportive fan base, was sent home Monday. Elimination is based on the combined judges' and viewer votes. Typically, audience votes from the previous show are combined with the judges' scores from the live performance, and the star with the lowest overall total is sent home. Tonight, the star with the highest overall score was named the champion. Can't get enough Dancing with the Stars? Check out the show's official Slacker Radio station! Riley, Bleu and Osbourne each performed three routines Monday - a samba relay, a judges' pick and a freestyle. At the end of the night, Riley was at the top of the leaderboard with 64 judges' points. Bleu had 62 points, and Osbourne had 57. Tonight, the three finalists each performed a single routine featuring two separate styles of dance. Head judge Len Goodman called it the toughest test of the season because the stars had just 24 hours to learn their fusion dance. Corbin Bleu, cha-cha/foxtrot: Judges praised the foxtrot portion of the "High School Musical" actor's fusion routine but found flaws in his cha-cha. Goodman said he was all set to grab his "10? paddle until he saw the mistakes. Added judge Carrie Ann Inaba: "I have so much respect and love for you, unfortunately, you lost it on the cha-cha." Judge Bruno Tonioli agreed, but he and his counterparts praised Bleu for putting together such a good routine in such a short period of time. Each judge awarded Bleu 9 points, for a total of 27, and a two-night grand total of 89. Jack Osbourne, paso doble/salsa: Judges had high praise for TV personality's routine. Tonioli said he appreciated the way Osbourne interpreted the spirit of the two diverse dance styles. Inaba also liked the routine, but told Osbourne: "You were a hair flat-footed on the salsa." Added Goodman: "Let me tell you, of all of our celebrities you have given men the most pleasure to watch because week after week you've got better and better. … " Each judge gave Osbourne 9 points, for a total of 27 for the routine, and a two-night grand total of 84. 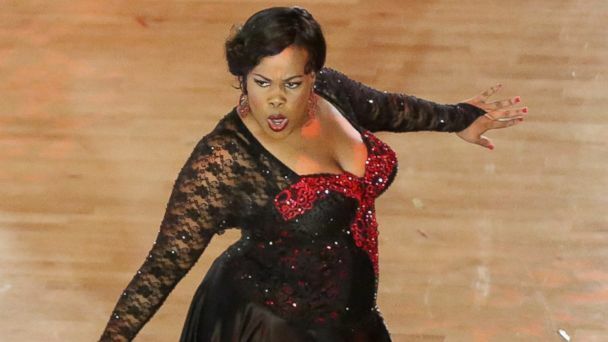 Amber Riley, samba/quickstep: Inaba told the "Glee" star that her routine melded the two dances so seamlessly that she seemed to have created a completely new style. Goodman echoed Inaba's enthusiasm, telling Riley that she was "absolutely bedazzling," and Tonioli said the performance was uplifting. "I counted every beat. You did not put a foot wrong … incredible," he said. Each judge awarded Riley 10 points for a total of 30, and a two-night grand total of 94. Tonight's episode was the 12 th in the ABC dance competition's 17 th season. The episode featured performances from contestants who were eliminated earlier. In addition to the celebrity dancers, Enrique Iglesias performed his song "Heart Attack," Colbie Caillat sang "What a Wonderful World," Lady Antebellum sang "Compass" and the Norwegian duo named Ylvis performed its viral video hit, "The Fox (What Does the Fox Say?" Eliminated earlier on in this season were NFL player Keyshawn Johnson, actress Elizabeth Berkley Lauren, singer Christina Milian, reality TV star Nicole "Snooki" Polizzi, TV host Bill Nye, actress Valerie Harper, actress Leah Remini and actor Brant Daugherty.